Issues 1&2 available online for free here! Once you’ve discovered how cool these hard working spacers are, you can get a physical copy of volume one here! This blue collar crew of space salvagers are cleaning up the galaxy one wreck at a time. Captain Bill Roenick, head honcho of Harrier Salvage, is on the job. He and his crew have been contracted by the Allied Trade Corporation to run salvage operations on a derelict Darzinean Warspray left floating in space. Roenich, the large and imposing Tipernian Ty’r, and impulsive Brigby are aboard the abandoned vessel, while pilot and eye in the sky Teagan monitors things from the cockpit of the Harrier. Making his way through the Warspray, Roenich reports signs of heavy combat on the ship before he loses contact with his crew. Now, separated from Ty’r and Brigby, and cut off from the Harrier, Bill Roenich makes his way through the supposedly empty ship as he attempts to link up with his crewmates. His progress is opposed by the appearance of security robots who have determined that he’s a threat. There’s been a gaping hole in my life for a while now, and I blame Fox. That’s right, I’m one of those people still hanging on to the travesty that was the cancellation of Firefly. I’m not proud of my inability to let go of it, but I can at least own up to it. I’ve had some relief in the form of comic books from Dark Horse Comics, but to be honest those seem to be coming very few and far between. More recently, a show on the SciFi channel (I’m not calling it “SyFy”…) called Killjoys has also helped ease my pain, but it just isn’t enough. I need more. Now I’m not going to try and tell you that I’ve found the cure for my problem. It just isn’t that easy… But what I will say is that in the online comic series Salvagers, I’ve found another story, featuring another set of interstellar misfits, that carries with it much of the same spirit of Firefly. In this science fiction story, things are all tidy and neat. This isn’t the Star Trek universe where intergalactic society is all about learning and exploration. In this universe, people have to work for a living, and that often means throwing their backs into the work on behalf of rich corporations that pay out trifles for their dirty work. Such is the case with Harrier Salvage. We’re introduced to the Harrier crew in the middle of their latest job, running salvage on an abandoned warship. The thing is, this ship isn’t as “abandoned” as they were led to believe, and while there’s no sign of the original crew, the current occupants aren’t particularly keen on someone poking around. In the chaos that ensues, we get to know a little bit more about Roenich, Ty’r, Teagan, and Brigby as they try to deal with their increasingly complicated assignment. I’ve come to learn that not all online comics are created equal. The difficulty, and beauty, of sorting through online content is that with pretty much everyone able to put their work out there, it isn’t going to be easy to find one that works for you. When I found this one, the first thing that stood out was the artwork. George Acevedo has done some very good work with this title, a little bit reminiscent (at least for me) of Marc Silvestri’s work on Cyberforce. The characters have some cool designs, and the action is dynamic and clearly defined. The next thing that I found was that Bob Salley’s writing was more polished than I was expecting. Everyone has their own “voice”, and the dialogue felt more natural to me… In some self-published work, the dialogue has to be given a little latitude, but I had no issues with Salley’s work. 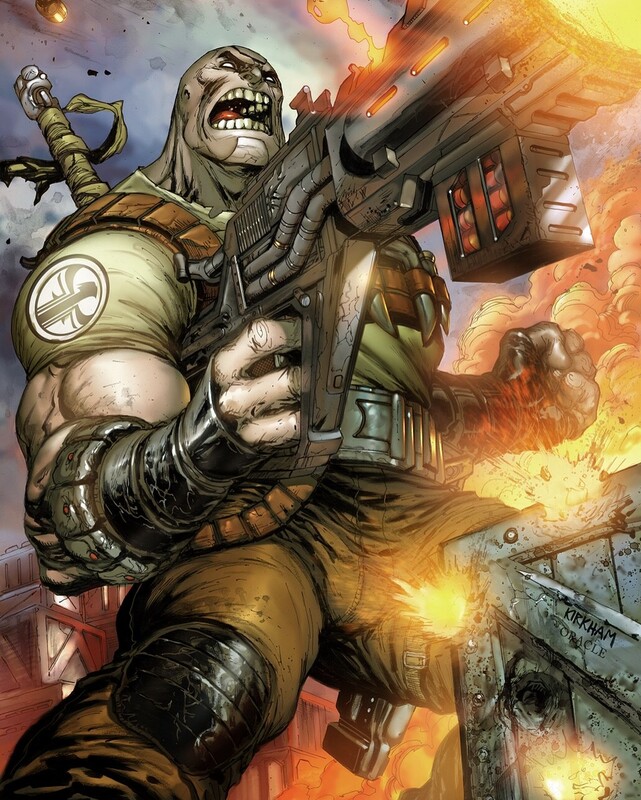 So to sum up… Although not written by anyone named “Whedon”, Salvagers is an impressive work in its own right. In a market filled to the brim with superheroes, a good old fashioned space opera is a nice palate cleanser. Is the work here perfect? Not necessarily, in everyone’s eyes, but I find that even the rougher works there’s something in there to polish up and hold as valuable. 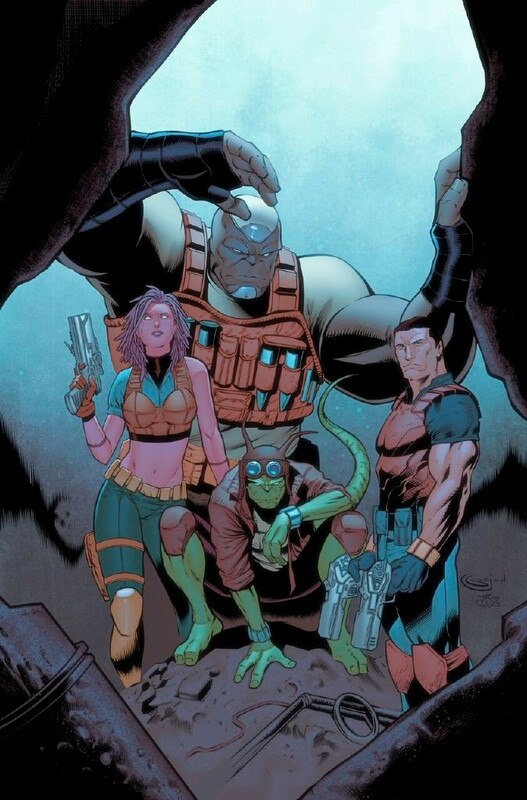 Personally, I enjoyed the hell out of Salvagers, and I fully intend to dip further into the series. Check ’em out for yourselves, again in the online comic on their issuu.com page, and through social media on Facebook and Twitter. 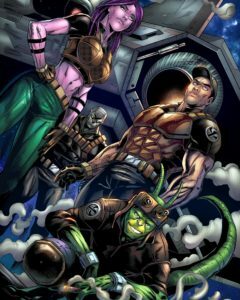 If you like what you see, and you maybe want to commit a little more to the series, the tradepaperback can be found at salvagers.bigcartel.com.